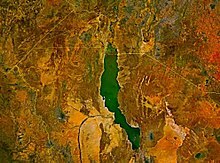 ^ Lake Turkana, Ethiopia/Kenya. USGS. （原始内容存档于2012-02-06）. ^ Historic lake levels are graphed in the World Lakes Database 互联网档案馆的存檔，存档日期2006-01-18..
^ A summary of the European discovery as well as Teleki's map and some Turkana tribe legends are stated in a University of Trieste 互联网档案馆的存檔，存档日期2007-12-06. document online. ^ A good introduction is stated in the Regions of Kenya 页面存档备份，存于互联网档案馆 site.